Blog world is status quo currently, but comedy world is back and will be in full swing for the next few weeks. This week my partner Shannon and I (together, Just Shair) discuss some older and newer celebrity crushes. Um, stuff gets kind of weird haha! Feel free to watch to see if you relate to any of our crushes and laugh along with/at us! Plus please write to us any of your crushes! A technical difficulty actually ate part of our footage so we may eventually do a part 2 anyway :) Also, on our site we have a silly pictorial preview of what you're in for in case you can't watch the video yet! Next up on deck are segments on roller skating (where did that "sport" go?! ), personalities you encounter during election season, and dumb song lyrics! For those who are curious, in the video I'm wearing a Retrolicious dress and a Luxulite brooch! This was an impulse purchase if there ever was one! I was on one of my "city hikes" that conveniently went around one of my favorite vintage stores in Denver. (Boss Vintage in the Baker neighborhood, for any other Denverites reading!) I'd never made a purchase there, because as lovely as their dresses are, they historically were kind of pricey. But we made a detour into this store so I could at least window shop, and towards the end of combing through the rack of 70s dresses I found this beauty. I immediately got excited, checked the sizing, and then got more excited as the measurements appeared like they would work for me. 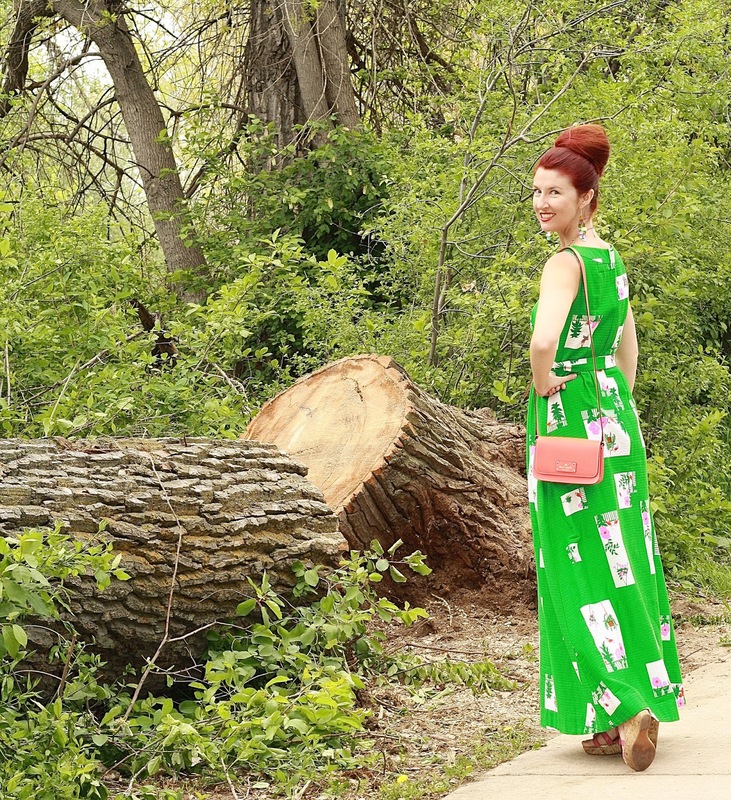 I initially said we should come back this way if I was still thinking about this dress by the end of our walk, but instead I decided to try it on right then and there and upon it fitting I knew I needed it. Plus, it was only $56! 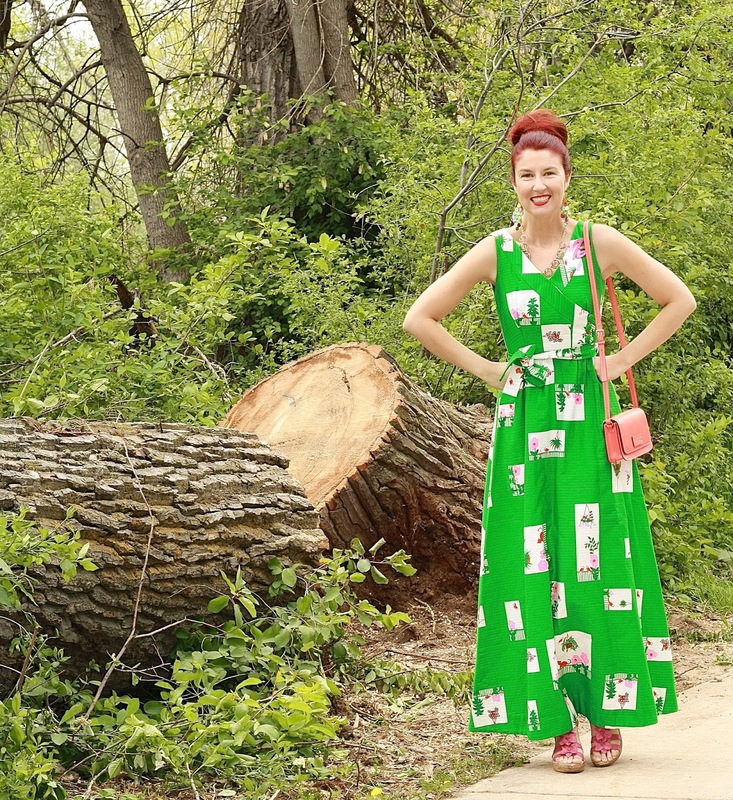 Depending on your shopping habits that may not be impressive, but a flawless dress from the 70s with a very sturdy fabric (with a novelty print) is usually a bit to a lot more than that! I've had a long time thing for 70s dresses and lately I've been on a huge maxi dress kick. Denver can be so windy and back and forth temperature wise in the spring that I've finally resolved maxi dresses (and skirts) as my answer to keeping my style but being equipped for all weather while keeping more my feminine style. I'm a luke warm fan of Melissa Etheridge. I respect her musicianship a ton and while I like a bunch of her songs, some of her other tunes don't really do it for me. But, I like "Come To My Window" and I decided to use it for this blog post title as the scenes on my dress are stuff you'd see in an apartment (or regular home, I suppose) window. I'm sure this is a song that everyone has heard at least once. Happy Thursday, all! I also had a crush on Kirk Cameron and Taylor Hanson, as well as Charles from Charles in Charge, BIG time, haha! Oh, man, gotta love the '90s! As for your outfit, I love this shade of green on you and the prose and shoes are so lovely! Thank so much for sharing, girlie, and I hope you're having a great week so far! I absolutely love this dress and I would never have guessed it was from the 70s if you never said! It looks incredible on you and I adore the print! I agree with you, where did roller skating go!! You look amazing in this maxi dress! You do green so well! Such a babe in green! This maxi outfit is perfect! I love the bright green and your bun. This is so fun! That is such a fun print! And you got a great deal on it. This dress is incredible. What a beautiful color on you! I must say that this dress looks great! How pretty! I adore that vibrant color. Absolutely beautiful! You girls are hilarious! Seriously, I love your sense of humor! I've always adored how the green dress/top/blazer matches red hair color - looks always fairy tail'ish to me) You look stunning in maxy dresses! your green dress is so cute!! Love the print of that maxi dress! Gorgeous color too! I love your hair! they amazed me:) follow:) now waiting for U! What a great deal on your dress! I love love love your hair in a bun too. So chic! Haha, another great video! I remeber all of those boys and how everyone loved them. I was into Justin Timberlake. He was my first big celebrity crush and I was determined that I would marry him someday haha. I ended up with a Justin afterall and they were the same age too! Ditto on Rob Lowe...he's such a "pretty" good looking guy. I really enjoyed him on The Grinder and im so bummed that it got cancelled. Ah well. This vintage maxi dress looks so pretty on you, love your hairstyle too! I love watching your video's, so entertaining! Love the 90s too and I adore the dress on you! Green is definitely your color, babe! Sych a fun and lively dress dear. Happy Friday! Love that dress!!! It looks like it was made for you! And you can never really go wrong with a good quality vintage dress, so great buy!! This dress is absolutely perfect, and I can't get over your hair again! I wish the dresses my mother kept from the '70s were this cool! Can we all collective say "stunning", because, holy mackerel, that's what this entire gorgeous look - from hair to maxi dress - is. Killer look, sweet lady! This must be the first time I'm seeing you in a long maxi dress because you usually wear knee length. You look amazing and you pull off this dress so well and it makes you look so tall! Love the maxi length on you. The green and pink is great together! you look gorg in this dress w/ your hair color! totally pops! Green is so your colour, who am I kidding every colour is your colour Lauren! Shopping and exercise... I LIKE IT! ;) Loving the print and length! This dress and especially this colour looks so so so good on you! Happy Monday dear and lotsa luv! Love this dress on you and love these pictures! You look like you've come fresh out of an later series episode of Mad Men! Congrats on this awesome find! Love the color on you! Nooo, you are not weird at all! I loved your video, refreshing, not just like other videos some people post - I won't say about what, because in case someone does it and reads the comment, could feel offended. But I loved the video with Shannon, it is so natural and I think you look fantastic on the video! I like Alvin :) I have been absent for a while, I guess I told you (don't remember), because I unfortunately caught the terrible - oh yes, no exaggeration - swine flu. Now I am finally out of bed :) This vintage dress you are wearing is really fabulous! Lovely pictures, you look very beautiful - I love maxi dresses! Hope you have a nice week! I've tried the leave an item I like behind and then come back route before. It usually works out so I'm not impulse buying but there was one time when the item was gone. Heartbreaking! Wow! What an awesome find! This dress is gorgeous! And seriously, your hair!! It is just so pretty!! I'll be heading over to check out your Just Shair video right now! OMG, you guys are too cute and hilarious! Girl, this look is to die for! You look amazing!